The global market share for online management software will grow to $6.68 billion by 2026. Having an online work order management system is one of the surest ways to increase business efficiency. It helps you keep up with scheduled and on-demand tasks that are otherwise manually overwhelming. What Is Online Work Order Management? Work orders refer to company documents that are internally generated to authorize specific work. Any department in an organization can create them in relation to a specific task. Their primary function is to initiate and clarify work to be done. They also indicate the delivery date and any special instructions for the order. An online work management system helps eliminate the mistakes that usually accompany work orders. It allows organizations to get work done by providing accurate record keeping. With the management software, you’ve got the time and freedom to concentrate on more crucial aspects of your business. Overseeing all the tasks that come with running a business can be very challenging. Regardless of the efforts in trying to keep up with manual tasks, pitfalls are bound to arise. The introduction of computerized management software has brought about the overall efficiency of departments. 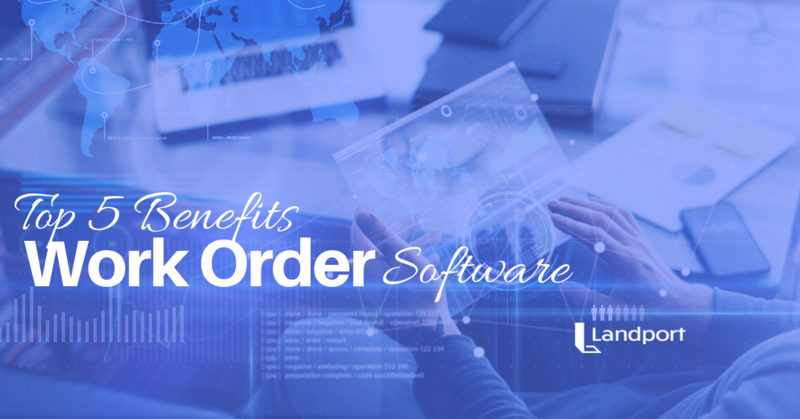 Specifically, here are some tangible benefits of using online work order management software. Once all the tasks have been confirmed, they gain approval through the cloud supported work order management software. It becomes easier to schedule and prioritize orders according to need and urgency. The transparency that comes with the scheduling makes things run effectively. Online work order management software captures information automatically. This eliminates the need to enter data in paper records manually. Besides, maintenance personnel has access to all the necessary information on their mobile devices or computers. The personnel doesn’t have to sift through piles of files or clipboards in search of specific information. The systems provide for real-time tracking while providing for regular updates in the process. Most systems can categorize tasks and allow for their management in real time. Work order management systems eliminate sudden shortages. Unlike paper orders, online systems can place orders for equipment and inventory as the need arises. Business can avoid holding the stock that they don’t need in storage. Online work order management systems play a crucial role in measuring performance. They’re very specific in keeping track, not only for the whole system but also at a micro level. Having a functional order management system is vital for keeping your records up-to-date. With updated records, you’re able to reduce or eliminate stoppages and interruptions. The records play a vital role in the management team in planning. They can plan and budget for the future from a position of relevant and updated information. Through the systems, operations and equipment are upgraded on time. The information available also provides a solid foundation for setting goals and timelines. One problem facing most companies with many assets is the inability to keep track of them. For example, a piece of equipment in need of servicing must accurately be identified. The maintenance team can erroneously place replacement orders for the wrong problem or equipment. Online work order management system helps eliminate such challenges by enabling the blueprint to be loaded into the system. When a piece of equipment requires servicing, its exact location within the facility is identified and photos of the faulty part can be added on the work order. It’s also marked on the work order to provide assurance that the identification is correct. With such identification, the chances of getting the order wrong are greatly reduced. Bar code scanning makes ordering or parts accurate, easy, and quickly. It also does away with the delays caused by the incorrect transposing of serial numbers. Once maintenance technicians receive online work orders, they can start work immediately. They can get access to all the information they need, and they know the procedures to follow. This makes it easy for technicians to eliminate delays. Updating of completed work is also easy with the click of a mouse. Unlike online work orders, manual ones can be altered, and their capturing can be wrong. This can lead to unnecessary costs for the company. Management systems are required to comply with both national and international regulatory standards. Online work order management software is an avenue for businesses to demonstrate their level of compliance. It reduces the amount of time and paperwork it takes to prepare for an audit. Maintenance managers must undergo periodic audits by regulatory bodies. In preparation, they can simply generate reports of their work orders through the systems. In the long run, compliance becomes easy to trace and reduces exposure to noncompliance penalties. For a business to effectively compete in its industry, it needs to have systems that improve efficiency. One recommendable system is an online work order management software. It’s a feature that serves to streamline business documents and makes them accessible from a central point. The system allows various departments to work simultaneously and to reduce delays. It eliminates manual or paper-based work orders which can take longer to create. The software presents a business with a variety of benefits. By providing access to business documents, departments can keep up with various business work orders. Increased business efficiency translates to improved employee productivity. The software is crucial in increasing the availability of equipment and their performance. The chances of running out of inventory are eliminated, and operations hence run smoothly. Most importantly, the software is a means for keeping up with regulatory standards. It reduces the time spent in preparing for both internal and external audits. If you seek to improve your business operations, consider having online work order management software installed. If you have any questions, be sure to contact our expert team.